A shotgun in his lap and a shawl across his shoulders, Imran Zia spends the winter nights guarding the street outside his collapsed house. "When I drove here after hearing about the earthquake, I felt sure our family's days in Muzaffarabad had come to an end," says the 26-year-old who lost his teenage sister to the disaster. "But after burying my sister in this soil, my view has changed - we cannot leave this city behind," he says. "Right now, this is the only place to be." Muzaffarabad looks as if it has been smashed by a cosmic fist, some two-thirds of its structures ground to dust by October's earthquake. The road here from Islamabad, through high winding valleys lined by sparkling rivers, offers ominous hints of the heartbreaking scenes ahead. Dramatic cracks run through the tarmac and entire trees have been turned brown, draped in the dust of fresh landslides. But nothing I saw on the road could have prepared me for the incredible generosity of the people who had lost all they loved to the quake. On the festival day of Eid, marking the end of the Muslim holy month of Ramadan, Malik Naseem emerged from the ruins of his house with steaming bowls of "sevian" - a sweet delicacy. "We used to celebrate Eid with our family and friends," he said, offering me a bowl. "But the earthquake took those familiar faces away and brought you media people here instead. "So we celebrate with you. You are our family this year." 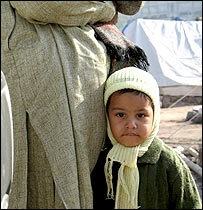 Beneath this instinctive warmth came a reminder of the raw grief of Muzaffarabad. Malik Naseem asked me if I had enjoyed my time in his city. I said I had met many good people. "No," he replied, crouching and cradling his head in his hands, "the good people were all killed in the earthquake. Only we are left." 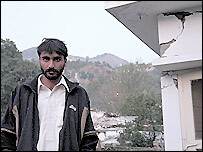 I visited Muzaffarabad to put questions posted by readers of the BBC News website to the survivors of the earthquake. A common question - could any good come of the catastrophe - brought a surprising response. Many survivors said the quake had been a leveller in every sense, a truly democratic disaster that had destroyed the lives of rich and poor alike. In the teeming tent cities where thousands of families endure bitter cold and poor sanitation, homeless university professors and civil servants spoke in perfect English of their desire to see a new, more equitable society rise from the ruins. Behind broken walls, I saw expensive microwave ovens and computers that testified to the shattered aspirations of Muzaffarabad's middle class. Mobile phone text messages, circulated on the day of Eid, seemed to sum up the public mood. "Shattered homes, shocked faces, scattered people, stony eyes, toppled tombstones and desolation everywhere. Anyway... Eid greetings," read one message, composed in a mixture of English and poetic Urdu. News of remote Himalayan villages untouched by telecom networks reaches Muzaffarabad on foot. Every day brings a new influx of families into the city. They have trekked weeks in search of food and shelter, bearing stories that seem impossible to confirm. They speak of children plucked alive from the rubble three weeks after the quake and of entire villages swept away by landslides. One man told me of a remote village that was covered - but not entirely crushed - by rocks. Under a ceiling of stone, the villagers carried on as before, surviving on food from the bazaar, until a team from a neighbouring area dug them out. The tales told by relief workers returning from the upper reaches of the Himalayas are no less incredible. Pete Manfield, who has been advising the UN on building shelters in the Neelum valley, says "helicopters have been landing on knife edges" to reach isolated settlements. "Four weeks into an emergency, we're still discovering people who've received no relief whatsoever." It is a "shaming" fact, he says, that the shortfall in international aid pledges means help still cannot reach the neediest.